Puppy Girl is being the queen of the kennel on a hot, lazy Friday night. She pretty much represented how I felt too-I just wanted to go lay down on a big, fluffy cushion. 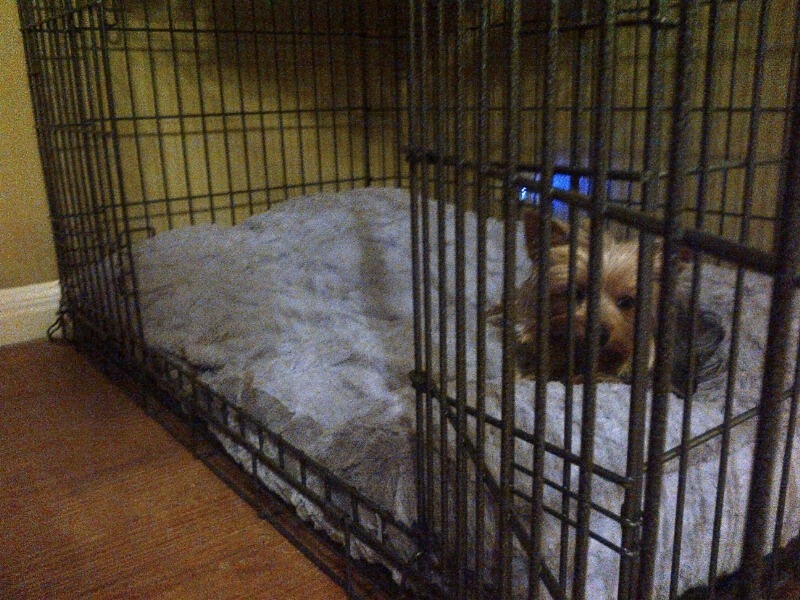 I would have even been okay with being in a cage so long as I could shut the door and sleep awhile. Oh, such are the dreams of an every day worker! Since arriving home from Hawaii, Sunday morning after a sleepless all night flight, it was immediately back to work both at the farm and the office. Monday I took my first ride after ten weeks on Mickey. Tuesday, I started working the Pixie pony. Thursday, after deciding the long Texas afternoons were too hot for the horses to be out without shade, we came up with the brilliant idea that I would get up earlier than 4:00 am. That way, while it was still cool (or at least not as hot) I could feed the horses, but also wait until they finished eating, (about 45 minutes) and then let them out in the pasture. Why wouldn’t I pick the week I was already fighting a five hour time change to move the start of my day even more ridiculously backwards? On Thursday, I wasn’t really sure how long the extra chores would take, so I got up about 3:30 am. It would have been 10:30 at night, just time to get to bed in Maui. I got the dogs, horses, cats fed. I showered, did my hair, got dressed for work and drove my car over to the barn to let the horses out. I glanced at the clock in the car and had to do a double take! It was 4:31 am!!!! No non-critical life support person should be awake or headed to work at this time! Oh my goodness! I was so mixed up I didn’t know if I was coming or going. I got to work in record time, no traffic at this time, Houston commuters take note. I got to work to find that in an attempt to conserve energy, I had no electricity until 6:00 am. I took my laptop and worked by one of the few lights that was activated. By 10 am, I needed lunch and a nap. Thursday night, I was back on Pixie and dragging bad. Problem is by evening, I think it is afternoon in Hawaii and get my second wind. I managed my time a little better this morning and only got to work 15 minutes before the lights came on! At work, I am working on annual budgets, so you can just imagine how well that is going. This afternoon was physical therapy and my favorite type of session where they force your joint as far as it can go in every conceivable direction to see how much progress you are making. First, I was in tears. Second, I cannot be arrested and handcuffed right now. My arm will not go behind my back. I will be sure to express that to the officer when I am arrested. Or I could just not be arrested, that would work too. Tonight I worked lil Pix while Lauren rode Bruno. I know it will be good for both of them to continue to be on a regular training schedule. But for me, I feel like I made it through my first week of boot camp. Move over Puppy Girl, I am ready to share the cushion and end this week! This entry was posted in Life on the farm, The horses of Six Meadow Farm by Exechorseluver. Bookmark the permalink. I really dont know how you do this, but deepest respect! Thanks but you know exactly what I go through.